Outdoor Lighting Perspectives of Nashville has been selected to light the Capital Tree in Nashville again this year! 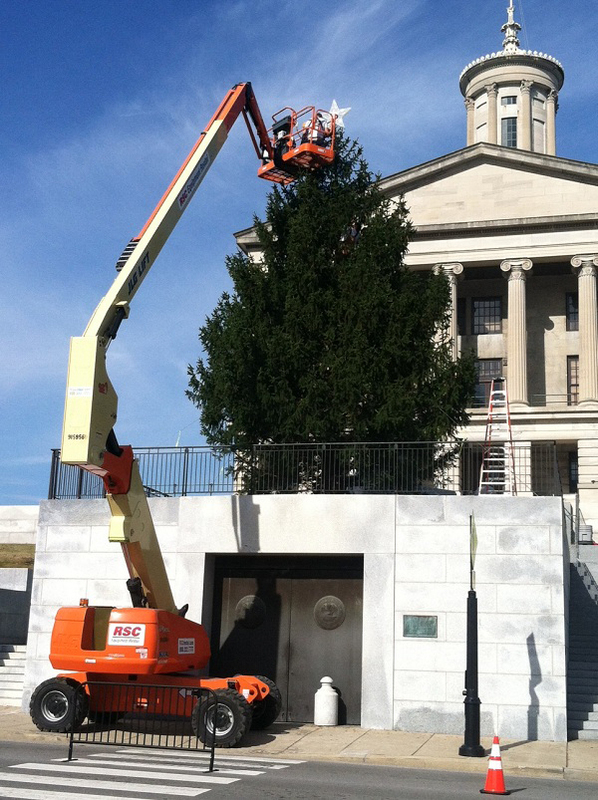 A first look at the tree chosen to become the TN Capital Tree for the 2013 holiday season! We are very honored to announce Outdoor Lighting Perspectives of Nashville has been chosen to light the Capital Tree in Nashville for the upcoming holiday season. The tree will be lit in honor of the 2013 Christmas season and marks the second year Outdoor Lighting Perspectives of Nashville has been asked to design and install the annual lighting for the tree which will be located in the Legislative Plaza in downtown Nashville for all to enjoy! In 2012, the Capital Tree was an evergreen in excess of 30 feet. We used approximately 4,000 LED C7 lights which were carefully selected and placed within the tree along with red and gold ornaments to make it shine like a jewel against the Nashville skyline. This year’s tree promises to be even more breathtaking than its predecessor as we are filled with anticipation to begin lighting this lovely giant of a tree! The tree that has been selected as this year’s Capital Tree sits a majestic 30 feet high and will be illuminated using over one mile of lights! 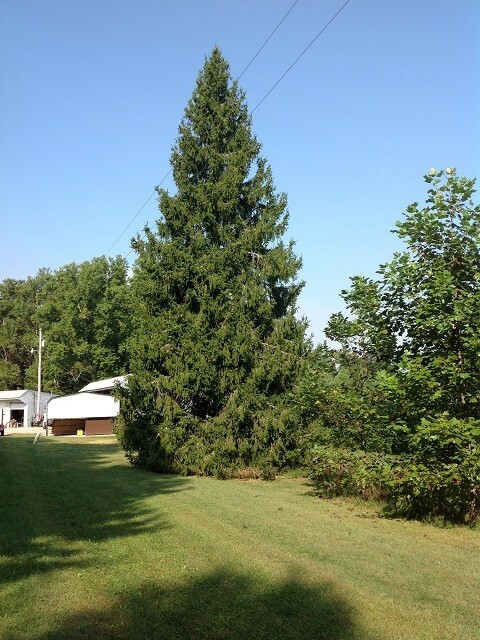 We have been given the task of transforming this conifer to magnificence in just two days. During this time, our installers will be instilling the use of an 80 ft. articulated lift to ensure every light is placed in the perfect spot to shine brightest, as well as topping this beauty with a three-foot jeweled star. 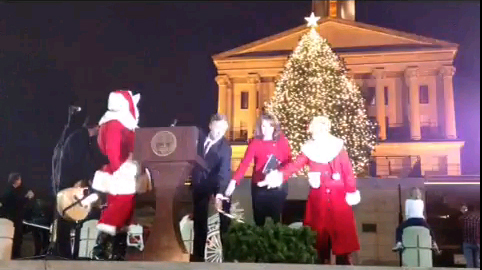 Governor Haslam and the First Lady lighting the Capital Tree during last year’s illustrious event. In keeping with tradition, the Governor of TN will flip the switch to light the Capital Tree during the annual Capital Tree lighting event. Last year, the tree was brought to life amid a crowd of Tennessee’s finest as the focus of an evening filled with holiday cheer, food, entertainment and even horse & buggy rides. We anticipate this year’s event will be another showstopper and we will keep you informed when the date and time for the event has been finalized — stay tuned — more to come! Outdoor Lighting Perspectives of Nashville busy lighting the 2012 Capital Tree. Contact Outdoor Lighting Perspectives of Nashville to learn how we can make the holiday lighting at your home or business breathtaking too. Call us at (615) 373 – 0638 and make this Christmas a time to remember and cherish. After all, the capital entrusts us for their outdoor holiday tree lighting needs, shouldn’t you? See more magical holiday outdoor lighting and holiday tree lighting by visiting our holiday lighting gallery located on our website. This entry was posted in Holiday outdoor tree lighting, Lighting the Capital Tree in Nashville TN, Outdoor Lighting Special Events and tagged Bill Haslam Governor of TN, Christmas lighting Nashville, Nashville Christmas Lighting, Nashville holiday lighting, Nashville special event holiday tree lighting, Nashville TN Christmas at the Capital event, Nashville TN holiday lighting design and installation, Outdoor Lighting Perspectives of Nashville chosen to light the 2013 TN capital tree, TN capital tree lighting for 2013 by outdoorlightingnashville. Bookmark the permalink.